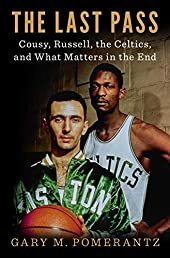 The Last Pass: Cousy, Russell, the Celtics, and What Matters in the End | Your #1 Source for Kindle eBooks from the Amazon Kindle Store! At the heart of the story THE LAST PASS tells is the relationship between these two iconic athletes. The book is also in a way Bob Cousy's last testament on his complex and fascinating life. As a sports story alone it has few parallels: A poor kid whose immigrant French parents suffered a dysfunctional marriage, the young Cousy escaped to the New York City playgrounds, where he became an urban legend known as the Houdini of the Hardwood. The legend exploded nationally in 1950, his first year as a Celtic: he would be an all-star all 13 of his NBA seasons. But even as Cousy's on-court imagination and daring brought new attention to the pro game, the Celtics struggled until Coach Red Auerbach landed Russell in 1956. Cooz and Russ fit beautifully together on the court, and the Celtics dynasty was born. To Boston's white sportswriters it was Cousy's team, not Russell's, and as the civil rights movement took flight, and Russell became more publicly involved in it, there were some ugly repercussions in the community, more hurtful to Russell than Cousy feels he understood at the time.